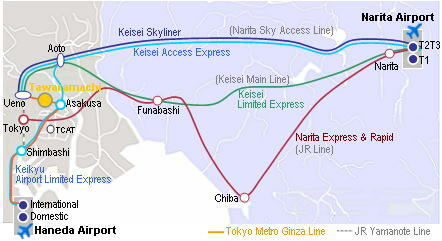 Keikyu Airport Limited Express (Keikyu Line and Toei Asakusa Line) links to Keisei Access Express. Direct access to Asakusa station from both Haneda Airport and Narita Airport. With heavy luggage? Taking a taxi from Ueno sta. should be easier, about 5 min., about 600yen per cab direct to Tokyo Ryokan door. Please show our HTML Map to your taxi driver. about 36 min. by Keikyu Line and Toei Asakusa Line, 620yen (from international terminal). Direct train runs every 10 - 15 minutes, otherwise, please transfer at Shinagawa sta. and/or Sengakuji sta.. Trains are more convenient and much cheaper from both airports, but if you would like to pursue the bus journey rather than railway ride, there are only 2 buses (1 in the morning and 1 in the afternoon) in 1 day from Narita Airport to Asakusa, there are many services from Haneda Airport to downtown Tokyo (but not direct to Asakusa, honestly bus is not recommended, on the other hand, trains are direct and more frequent service and less expensive). Taxi costs shown below is only estimated, but may be more (hope less) depending on traffic. 22:00 - 05:00AM adds up extra. Ueno Station (JR or Keisei) 570 - 890yen 5 - 6min. Tokyo Station 1,800 - 2,000yen 15min. Hamamatsucho Station 3,000 - 3,500yen 25min. Tsukiji Fish Market 2,500 - 3,000yen 20min. Asakusa View Hotel 410 - 490yen 2 - 3min. TCAT 1,800 - 2,000yen 15 - 20min..
Haneda Airport 6,900 - 13,000yen (toll not included) 30 - 50min. 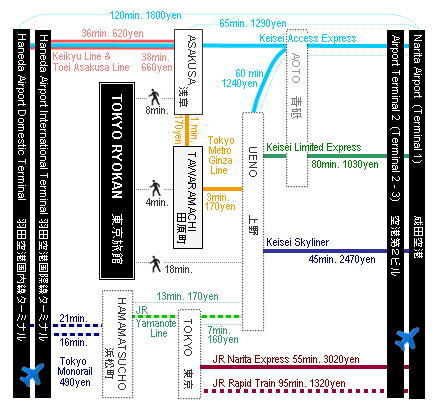 Narita Airport 19,000 - 26,000yen (toll not included) 60 - 100min. 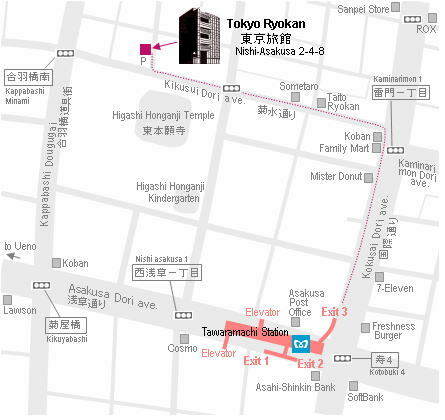 Tokyo Ryokan is located within a walking distance from several stations. 4 - 5 min. walk from Tawaramachi station on Tokyo Metro Ginza Line. 3 - 4 min. walk from Asakusa station on Tsukuba Express Line (TX Line). 8 - 10 min. walk from Kuramae station on Toei Subway Oedo Line. Keisei Line and Tokyo Metro Hibiya Line. 10 seconds walk from #19 bus stop of Megurin South Route (Green Line) on Kikusui Dori. 1) Take exit #3 of Tawaramachi sta. (G18) on Tokyo Metro Ginza Line. 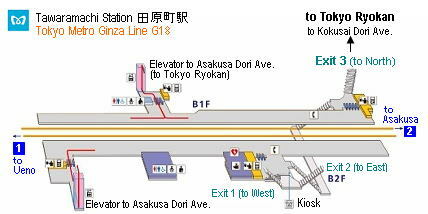 2) Go north (go straight as same direction as you go up stairs from underground) towards Mister Donut, FamilyMart (this convenience store shall be seen on your left hand side), Tawaramachi police box (in Japanese, 'Koban' very small two-story building, easy to miss! ), Asakusa view hotel (you've gone too far if you reached this hotel). 3) Turn left at the corner where Tawaramachi police box (the 'Koban') is located on your left hand side - just next after FamilyMart. This should be way before Asakusa view hotel or SanPeiStore. You will enter Kikusui dori avenue now (no English sign). 4) Pass Taito Ryokan on your right hand side, and pass the first traffic lights, then you should see the large roof of a temple on your left hand side. Turn right at the very first T-junction right at car parking lot (you'll see grave yards with tombs as well over the wall on your left hand side). This turning right should be before Kappabashi-minami-intersection traffic lights (second traffic lights on Kikusui dori avenue). Please do not go crossing this second traffic lights. 5) You'll find us on your left hand side immediately after the turning right at the car parking lot (P-ECOLO). In another words, Tokyo Ryokan is next to the car parking lot (P-ECOLO). 6) Welcome to Tokyo Ryokan! 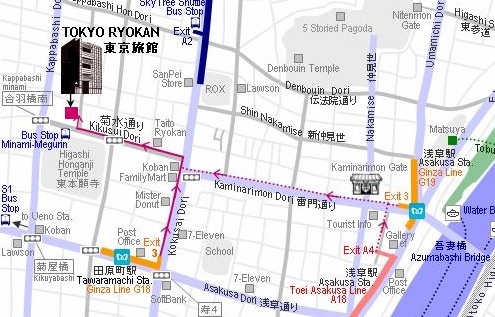 We are located north of Higashi Honganji Temple. Any difficulties finding us? Please call 090-8879-3599 for quick assistance.